Before "going green", I must admit I'd never really invested in much skincare at all, let alone anything high end. Through blogging I've discovered so many new brands and realised that sometimes the more luxurious brands can actually have superior performance, but sometimes you can find cheaper alternatives that work just as well if not better. 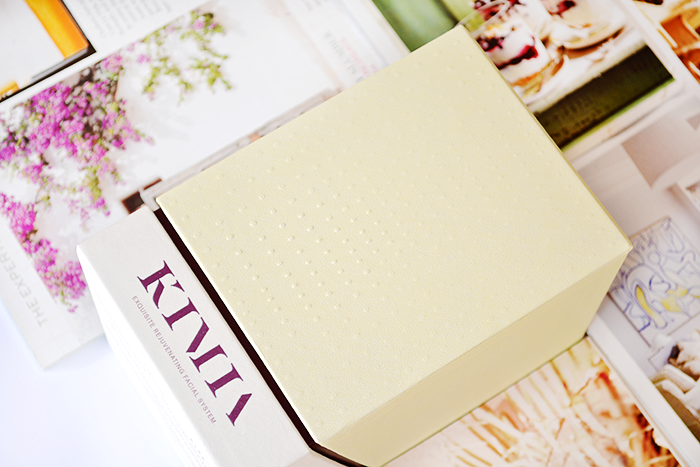 When I was asked a couple of months ago if I'd like to test out some products from luxury natural brand Kimia, I was intrigued to see if they would work for me, especially as the brand apparently has a celebrity following including Victoria Beckham and Kate Moss to name a few. I've been testing the Kimia Facial Rejuvenating System*, which is a two part system consisting of their Exquisite All Natural Face Oil and Hydra-Activator. I used these products for over a month in total, both morning and night after cleansing. I applied about 3-4 drops of the oil in the morning and 5-6 drops in the evening, patting onto the skin in an upwards motion. The next step is to spray the Hydra-Activator into your hand and massage into the skin; this product is designed to increase the absorption of the oil, using one spray of the activator for every drop of oil. For the first week using this facial system I noticed a significant reduction in the size of pores on my nose and my skin felt softer. After the second week however, I started getting dry patches on my cheeks which I'd never experienced before. The following week was spent experimenting with the amounts used to see if that would work better for me and I noticed the dry patches went away when I stopped using the Hydra-Activator. I'm not a skincare expert, but I think this could perhaps be because the top two ingredients are water and grain alcohol, or maybe it's just not suited to my normal - combination skin type. These products definitely have a luxury price point at £74 for the pair, which to be completely honest I personally wouldn't be prepared to pay myself. Although the packaging of this Facial System has a very luxurious look and the glass bottles themselves are lovely, I had to throw away the box straight away as the plasticy/rubber base holding the bottles in place smelt horrible! I also read this review from Amber (Amber's Beauty Talk) last month and I completely agree with what she said that these products could at least be organic for the price. I think this duo might be better suited for more mature skin, even though it's said to be suitable for all skin types. I've actually repurposed the oil as a cleansing oil now which I've found works much better for me! Overall these are nice products, but they just don't seem to be suited to my skin and didn't 'wow' me unfortunately. I'd love to hear if these products worked for you if you've tried them before? Great review Ria! I'm still undecided on this duo and have been experimenting myself and a way to use it that suits my skin. I understand that alcohol could have potential benefits in skincare, but no wonder it was drying out your skin if it was the 2nd highest ingredient! Glad you are no longer putting that on your face... I can't imagine it would be great for anyone.